Thursday, Feb. 21, 2019, 7 – 8:30 p.m. Sponsored by the UW Japan Studies Program and made possible by a gift from the Mitsubishi Corporation. 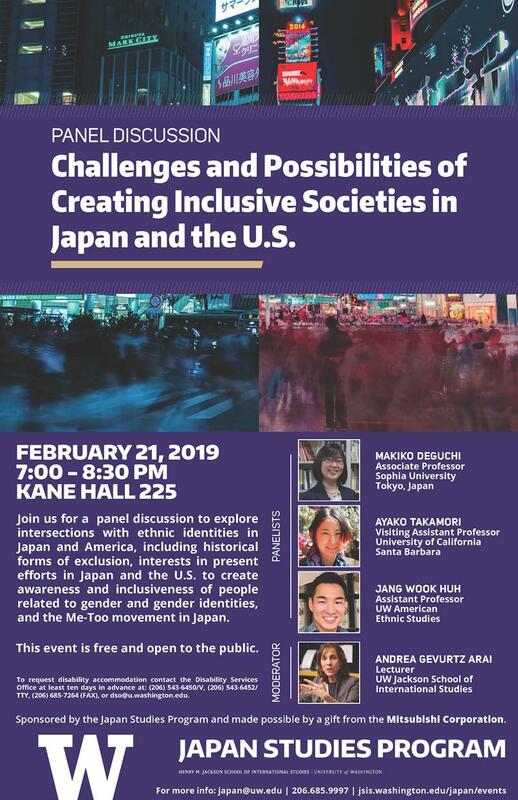 This special panel discussion will explore intersections with ethnic identities in Japan and America, including historical forms of exclusion, and interests in present efforts in Japan and the U.S. to create awareness and inclusiveness of people related to ethnicity, gender, and gender identities. Panelists include Makiko Deguchi (Sophia University, Tokyo, Japan) who teaches on cultural psychology with a focus on racial and minority issues and privilege awareness, Dr. Ayako Takamori (University of California Santa Barbara) an anthropologist whose works focuses on comparative race and ethnicity, multiculturalism, and gender and sexuality, and Jang Wook Huh of UW American Ethnic Studies. It will be moderated by Andrea Gevurtz Arai, UW cultural anthropologist of Japan and East Asia.